For this lab we will assume that there are two Server 2012 boxes, configured on an isolated network of 192.168.0.0/24. Server 1 will be 192.168.0.1 and server 2 will be 192.168.0.2. 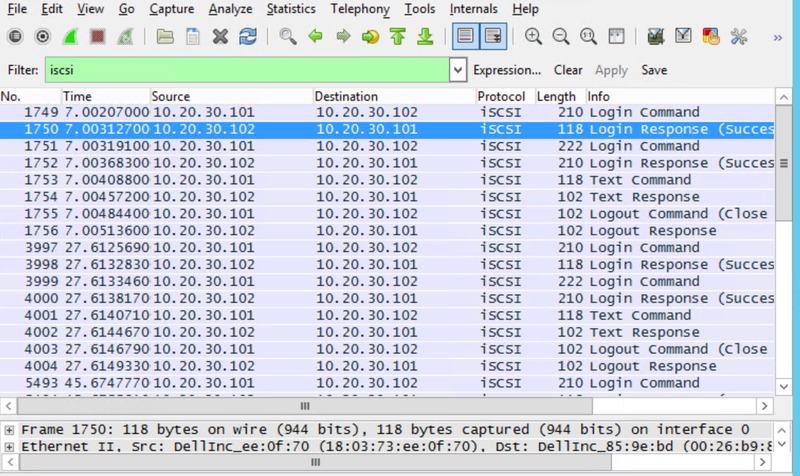 We will firstly install Wireshark for this process and then start capturing packets on the appropriate interface. Discovery > Discover Portal > Enter the IP address of the ISCSI target > Advanced > Select the local adapter > Select the initiator IP > OK and accept. Now go to the targets tab and click refresh. You should (if performed correctly) see a series of iSCSI packets (you might see different sessions as well) - choose one - right hand click on "Login Command" and select "Follow TCP Stream" - close down the "Follow TCP Stream" dialog box and your filter should be set to something like "tcp.stream eq X". Login Command (0x03): This is the initial step of the discovery - as the title suggests the iSCSI initiator is attempting to access the iSCSI target - in my case no authentication is being applied so we can connect anonomously. Login Responce (0x23): Returns whether or not the initiator is authenticated. Text Response (0x24): The target server then returns all available target servers. Logout Command (0x06): The client requests to logout from the target server. Logout Reponse (0x26): The target server confirms the logout process to the initiator.